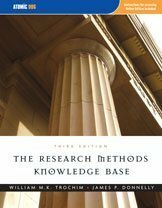 The Research Methods Knowledge Base is a comprehensive web-based textbook that addresses all of the topics in a typical introductory undergraduate or graduate course in social research methods. It covers the entire research process including: formulating research questions; sampling (probability and nonprobability); measurement (surveys, scaling, qualitative, unobtrusive); research design (experimental and quasi-experimental); data analysis; and, writing the research paper. This book introduces special classes of Fuzzy and Neutrosophic Matrices. These special classes of matrices are used in the construction of multi-expert special fuzzy models using FCM, FRM and FRE and their Neutrosophic analogues. This textbook provides a first course in data analysis for students majoring in the social and behavioral sciences. The book is intended to be comprehensible to students who are not planning to go on to postgraduate study. This book is designed to introduce doctoral and graduate students to the process of scientific research in the social sciences, education, public health, and related disciplines. It is a comprehensive and compact source for foundational concepts.